Dustin Lance Black is best known as the Oscar-winning screenwriter of Milk, and also for writing the Clint Eastwood-helmed biopic J. Edgar. In his crafting of the stories behind those films, he�s shown a penchant for wanting to bring a creative, not necessarily linear, edge to the proceedings. Eschewing the safe way out in this day and age of horrible remake after horrible remake is always a breath of fresh air, and hopefully Black will continue to push the creative envelope. 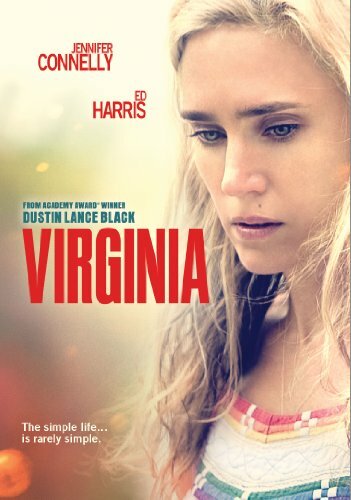 His first foray into feature directing, 2010�s Virginia, is just as daring at first, but, unfortunately, the film loses its way about halfway through and becomes somewhat of a mess by the end. Virginia premiered at the Toronto Film Festival nearly two years ago, and was unceremoniously dumped into a handful of theaters in May of this year. It�s finally made its way to a wider audience, via Entertainment One�s new DVD release; a solid effort for a flawed film. Virginia (Jennifer Connelly) is a single mom involved in an affair with the very married Sheriff Tipton (Ed Harris), who is also running for Senator. This devout Mormon man attempts to distance himself from Virginia, but in not being the most emotionally or mentally stable person in the world, she decides to fake a pregnancy to keep Tipton around. Virginia has a teenage son named Emmett (Harrison Gilbertson), and he�s in a relationship with Jessie (Emma Roberts), who just happens to be Tipton�s daughter. None of their quirkiness compares to Emmett�s boss, Max (Toby Jones), who enjoys dressing up in women�s clothes. It becomes clear, quickly, that Virginia might be less crazy than we think, compared to the rest of the town. Virginia is one of those frustrating films that I wanted to like for its unconventional nature alone, but just couldn�t quite latch on to the story or any of the characters. The film is far too unconventional for its own good at times and winds up getting itself lost in the overdrawn myriad of subplots that abound. I, frankly, lost track of things on multiple occasions as characters are introduced immediately following a seemingly important scene, then unceremoniously dropped from the rest of the film for no reason (Carrie Preston�s Betty is a prime example of this). The good news is, Black takes things seriously the entire time, when things could have easily devolved into a total mess garnering nothing but unintentional laughter from its audience. It�s been a while (arguably, A Beautiful Mind) since Jennifer Connelly has truly delivered a memorable performance. I wish I could classify her embodiment of Virginia as award-worthy, but it�s difficult to argue that her performance is, indeed, memorable. She can�t restrain herself from going a bit over-the-top in a couple of instances, but her work is, mostly, a restrained-crazy. Ed Harris� Sheriff Tipton is difficult to like from the get-go, given what his character is doing before we even get to really know him, but this venerable character actor does fine work, as always. The rest of the cast falls victim to the aforementioned schizophrenia of the screenplay, and there really aren�t any other standout performances to hail. Entertainment One�s DVD is a nice one, beginning with a good-looking, anamorphic 1.78:1 widescreen presentation. Full of crisp, detailed images and a bright, vivid color scheme, this transfer presents the film in the best possible way, minus a Blu-ray disc. The audio is a Dolby Digital 5.1 mix, and things are livelier than expected, thanks to a score that�s allowed to breathe across the sound field. Dialogue is never a problem, remaining easy to understand throughout. The extras consist of the theatrical trailer for Virginia, as well as a 21-minute making of piece featuring the likes of Jennifer Connelly, Ed Harris, Emma Roberts, Dustin Lance Black, and Gus Van Sant, to name a few.